Through the mass crowds of Spaniards and travelers, street performers, fashion shops, ancient architecture and cathedrals of Madrid, one finds themselves lingering towards the smell of cured meat. 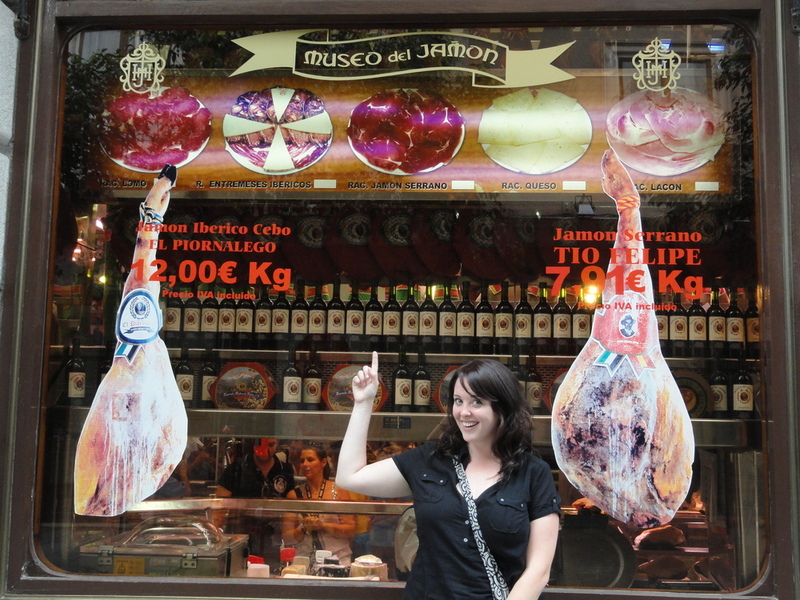 No place does it better than the Museo de Jamon in Madrid. Literally, 'Museum of Ham' this place has everything you could want from a quick meal to fixings for a picnic to even house-made baked goods. It's hard to pass this delicatessen/charcuteria without taking pictures because for us Americans we rarely see this much cured meat and cheese under one roof at any given time. Window shopping is only the beginning of the full experience of this place. The name 'Museum of Ham' is accurate because you are bombarded with such aesthetically pleasing gustatory delights that you just want to stand, stare and take every bit of in. You can peruse the veritable wealth of meats and cheeses in solo or sandwich form on either side of the deli or order from one of the many meals that they offer at their bar. It is standing room only so you have to carve your own niche out of the crowd to enjoy your food while you sip on a glass of Rioja or Priorat wine. If you prefer to have a more low-key eating experience, grab one of their fresh loaves of bread and a selection of meats and cheeses to accompany (don't worry, they will offer you a taste before you commit to either one). To top it all, they also have fresh-baked goods to end your meal on a sweet note including some of the best chocolate donuts served warm where the chocolate almost flakes off the spongy cake when you bite into it. Epic eats! This was easily one of the more memorable places that we discovered during our stay in Madrid and we recommend taking the time to visit this place if you are ever in this part of the world...even if it's just for the spectacle!